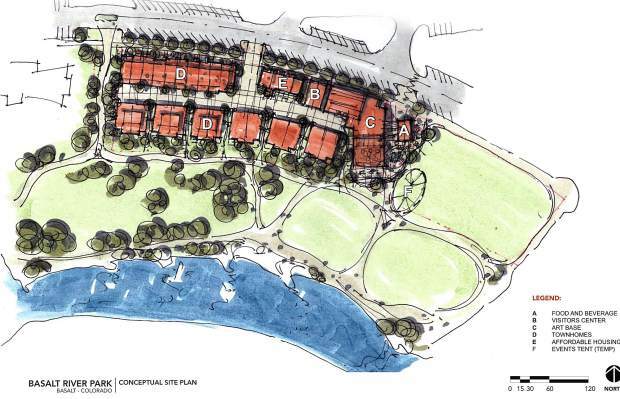 The latest proposal for the former Pan and Fork Mobile Home Park property sailed through the first round of review by the Basalt Planning and Zoning Commission on Tuesday night. The board voted 5-1 with little deliberation to recommend sketch plan approval to the Basalt Town Council, which will likely start its review in August. “I think it’s time we move on the project. It’s needed,” said planning commission member Gino Rossetti. The project received universal high marks for providing permanent homes for two nonprofits — the Art Base community arts center and the Basalt Chamber of Commerce. The Art Base would obtain a 7,000 square foot space while the chamber would get 1,300 square feet, according to the application. However, some commission members weren’t sold on the free-market housing component of the proposal — 12 duplex units in six buildings and 10 row house units. “The challenge for me is the residential. I struggle with there not being a hotel there,” said commission member Pat McAllister. Board member Eric Vozick said he was concerned that the housing will turn into second homes and not provide year-round vitality for Basalt. There also are six affordable-housing units as part of the plan. As proposed, they would be six one-bedroom rental units. The planning commission wants the development team to explore a more diverse selection. Commission chairman Bill Maron said the proposal by Belinski’s Basalt River Park LLC and property owner Roaring Fork Community Development Corp. is an improvement over the two prior applications submitted on the parcel near downtown Basalt. However, he also expressed concerns about the free market units becoming second homes. The property is along Two Rivers Road between the Rocky Mountain Institute Innovation Center and Midland Avenue. The site is envisioned by most people in town as an opportunity to improve the economic vitality of downtown. Finding the proper mix between parkland and development has been the tricky part. Town factions have bickered for years over various ideas. Belinski and company hope they struck a compromise. They are offering to sell about 1 acre of the 2.3-acre site to the town for expansion of an existing, adjacent park along the Roaring Fork River. The development would be limited to the remaining 1.3 acres. There has been nearly universal agreement throughout the fighting that the property would be a great location for a brewpub, but that’s not part of the plan. Basalt River Park LLC proposed about 1,000 square feet for a coffee shop. Belinski explained Tuesday night that they didn’t want to propose a larger site that fares well during the summer months but flounders the rest of the year. Downtown Basalt has seen its share of restaurants come and go, he noted. Brewpub aside, free-market housing will likely be the “key discussion item” during review of the project, according to a memo by the planning staff. Free-market housing was not among the uses approved for the property during a 2016 planning process. Town officials wanted “hot beds” rather than permanent housing or a condominium hotel. The town’s land-use code would have to be amended to allow for free-market residences. Audience member Gerry Terwilliger noted that a community survey showed little support for free-market housing on the Pan and Fork site. The town hired a firm called ETC in 2014 to perform the survey as part of its “Our Town” planning process. The survey results, released in December 2014, showed less than 7 percent of 481 respondents wanted housing on the site, Terwilliger said. Basalt resident Lynn Mace called the proposed mix “a great combination.” She said the property would help bring more people to downtown. The planning commission majority was willing to accept free-market housing. McAllister cast the only vote against recommending approval of the proposal. The project will head to the council next for sketch plan review. If it passes that test, it will return to the planning commission and council for a second, final round of review.